The downward trend in history’s share of the bachelor’s degree pie, evident since 2008, is perhaps more troubling than the raw numbers. The discipline has been falling out of favor since before the Great Recession, and, as I noted in an earlier post, the middling earnings of your average history major might contribute, but some other disciplines offer lower wages after graduation yet attract a growing number of students. I don’t doubt that the pressure to earn after college is a factor, but something else is going on here. The ever-incisive Julia Brookins has some ideas about the current decline, and I have some ideas to add to her list, but my analysis will have to wait for more info and more time to run through it. Some of Julia’s suggestions on why this is happening can be tested with data, and I’m eager to roll up my sleeves and do that testing, but for now all I can offer are a few different ways to view the devastation. The bar chart and histograms below show how widespread this devastation is. Between 2013 and 2015 for example, 81 percent of research universities saw a drop in graduating history majors. A declining number of institutions are showing increases. When looking at the distributions below the flat gain/loss comparison, a disturbing number of institutions have lost between 20 and 40 percent of their history majors, regardless of type of institution or time frame. Hover over a bar segment for a detailed description. Charts above exclude outliers – small programs where the addition of a few students swung the percentage above +200%. 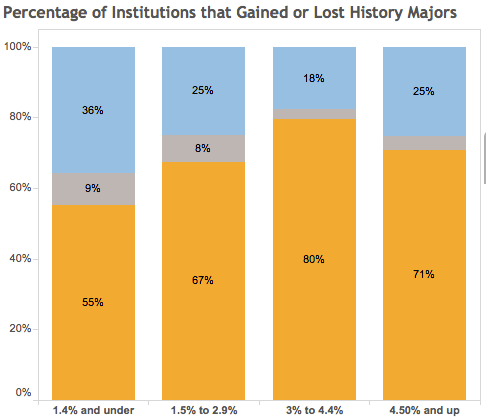 Curious about how the major is doing at institutions where it has long been popular, I created a category–history degree percent–that breaks down institutions by how well history majors were represented among an institution’s class of bachelor’s recipients in 2013. Those institutions, which had been among the most successful at drawing students to the major, are now among the strongest drivers of the downturn. For example, compare 2012 to 2015, and look at institutions that had history majors as 3 to 4.4 percent of their graduating classes. Almost 80 percent of these institutions lost students. Institutions that had a below average proportion of history majors were less likely to see a decline in history BAs during that time. In other words, it looks like the major is more likely to be taking bigger hits at institutions where it once was more likely to be thriving. Data from the National Center for Education Statistics, downloaded from IPEDS, cleaned in OpenRefine and visualized in Tableau Public.